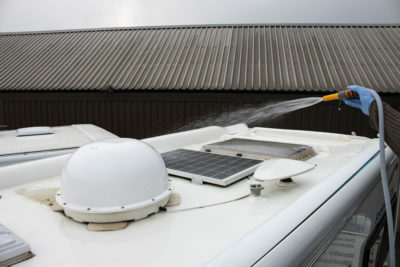 Keeping your motorhome roof clean not only helps to reduce the effect of black streaks, but it’s also an opportunity to check its condition and any accessories fitted up there. Most motorhome owners clean their roof twice a year, but if you store yours close to trees or the road, you might find you need to clean your motorhome roof more often to clear algae and debris build-up. 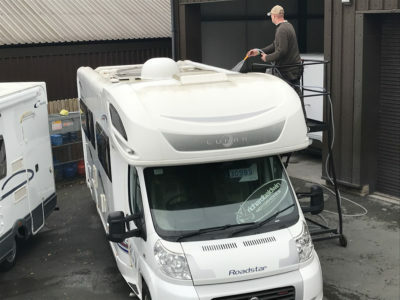 In this video, we visited Richard Baldwin Motorhomes in Halifax, to bring you our top tips on how to clean your motorhome roof as well as the equipment needed. A long-handled brush, preferably one with a hose attachment. 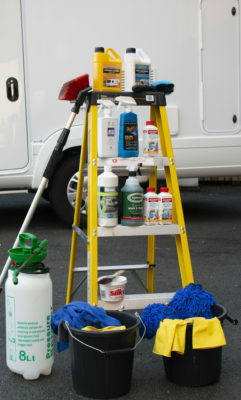 Make sure the ladder you use to clean your motorhome roof is the correct height. It really needs to be taller than the motorhome if possible, so you can easily reach the roof. 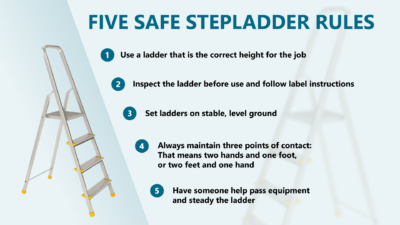 You also need to maintain three points of contact with the ladder. For example, two feet on a step and one hand on the rail. If possible have a second person to steady the ladder whilst you’re up it and allow that person to pass equipment up to you. It’s important that you don’t on the top step of the ladder. In a lot of cases, this isn’t a step, it’s a hinge mechanism. Before starting to clean the roof, park the motorhome uphill to encourage water runoff. If you’re on level ground use some levelling ramps to raise the front of the motorhome. Start by washing down the motorhome roof and removing any debris. If you’re using a hosepipe, be careful not to get too close to any of the vents or rooflights – use the spray to disperse any debris off the roof. If you’re using a pump sprayer, get plenty of water on to the roof to moisten and lift the dirt. 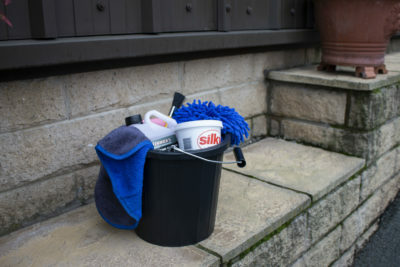 Dilute some shampoo in a bucket and with this solution moisten a microfibre cloth or sponge, then pop inside the motorhome and raise any TV antennas and open the rooflights. Wipe around the edge of the rooflights with your cloth or sponge, paying attention to the roof and the lip of the skylight. Once clean, close them up and go back outside to start cleaning the roof. 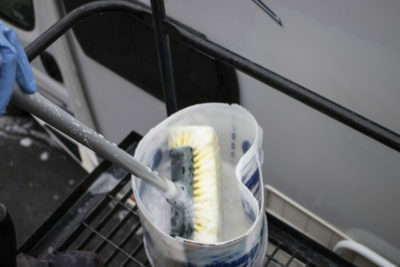 Dip the long handled brush into the shampoo solution and start to clean the motorhome roof. It’s a good idea to divide the roof into six equal parts, for example, front left; left side; and left back; focusing your cleaning on each segment. But start by cleaning around the rooflights you’ve already wiped down. Occasionally dip the brush in the shampoo solution as you continue to clean the dirt off the roof. Gently brush around any vents and fixings. You might not be able to get too close or under these items. If that’s the case, use a microfibre cloth or sponge on and under items such as solar panels, TV antennas and satellite domes. For more tricky areas we used a clean household paintbrush and some Silky cream cleaner. Areas, such as gutters and the TV antenna, can really benefit from some intensive cleaning, so here work the product in with the paintbrush to remove any dirt or algae from the moulding, then rinse off and wipe clean. Once half the roof is complete use your water source again to wash off any debris and dirt. Then repeat the cleaning process until the entire roof is nice and clean. To dry the roof, use a squeegee to soak up as much water as you can, then wring out to remove the water, and keep repeating this process. Motorhomes with overcab sleeping layouts can be a bit trickier to clean. For these areas, we suggest using a long-handled brush with a hose attachment that has a constant stream of water flushing through the brush head. Use this to wash as much as you can, repositioning the ladder as you go. But be careful not to over-stretch or lean over the motorhome. 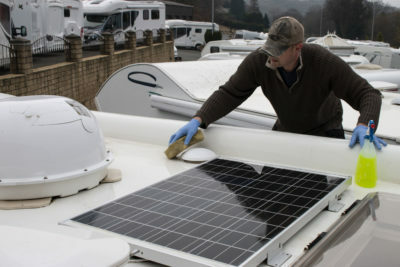 It’s important to keep your motorhome solar panel as clean as possible, as this will maximise the charge that the solar panel can put into your motorhome’s leisure battery when in storage. Gently use a microfibre cloth to clean and dry. 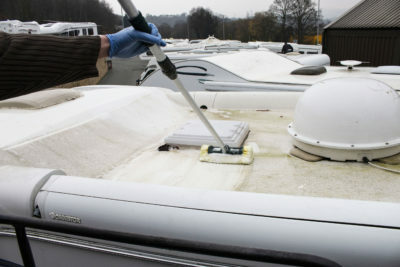 If you’re cleaning your motorhome roof before storing away, you might want to consider an overwintering product, a motorhome protecting product or a motorhome polish to help repel dirt, and prevent build-up of moss or algae. 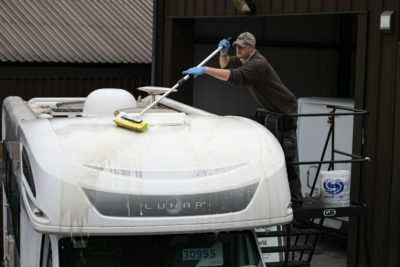 Once the motorhome roof is nice and clean, you’re going to have to clean the front, sides and back to get rid of any dirt and debris which will have run down the vehicle. Here’s our motorhome cleaning guide. 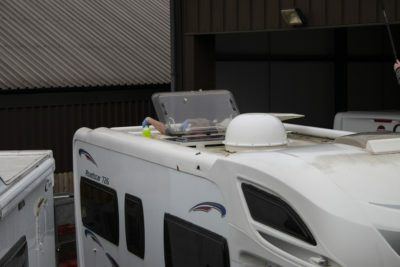 Got any tips on cleaning a motorhome roof that you’d like to share with other motorhomers? Feel free to comment in the box below. 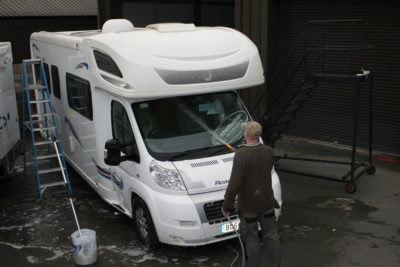 Hi it’s nice to know how to clean the motorhome as it’s my first year with my motorhome. I use wet and for get spray it on and leave very good . I would also mention to clean the wind out awning if fitted, especially the front end piece where the flies get stuck. 2 platform ladders and a builders 8ft plank. Been using this method for years. OK so long as you don’t mind heights. When I purchased my M.H. Twelve years ago I could wash the top,2 sides, back and front in 1 day, now it takes me 3 days. Nice to know I have been doing it largely as suggested. I use a platform ladder to walk along. Saves some time and a bit more stable. I always clean the van before adding cover, once dry.